"Daryl Miller didn't make it through airport security." It seems Daryl couldn't keep his pants up! That came off the AP news wire in Minneapolis. It seems that after an extensive time waiting in the security line that Daryl got frustrated during the waving of a metal-detector around his pants area and just dropped them. But that's not the end of the story, you see Daryl wasn't wearing any underwear either. I’m guessing he hadn’t done his laundry. In those long lines at the store, airport and especially traffic, sometimes our anger gets the best of us, sometimes not. I imagine we all can feel for Daryl, I know I can but taking off my pants? Uh no probably not. I've been known to yell at other drivers of course in the privacy of my own car and I have had a few gestures given to me in return. Our emotions are real, very real and very powerful too. And while it may be a bit extreme, Daryl might very well be a good model for us spiritually in dealing with the ups and downs of our spiritual journey, only please, make sure you've done your laundry and got your underwear on! One of my favorite writers about the spiritual journey has been Mike Yaconelli. The last book he wrote before his death was Messy Spirituality. At the heart of the book and of Mike's ministry, really, is the idea that Christianity is a messy journey: Jesus, God's Son deals with the messiness of lives and the messy-ist lives. We don't need to fear being transparent in the church, we need to be honest, God is not seeking clean, perfect people, God is seeking messy people who he can love on, care for, and heal to wholeness and holiness. He is looking for people to drop their pants. In this third chapter of Colossians, Paul writes to the Colossian church about God's messy spirituality. In verse 9 and 10 Paul uses an idea called causation. Simply put: if you've done this one thing, then it should cause you to do another thing. Some people will look at verses 5-9 with this idea of: "Yep, the Bible and Christianity is all about rules saying don't do this." And it is a pretty intensive lists of don'ts. But listen to Paul, "since you have taken off your old self with its practices." It seems to me Paul is saying, you took off the old self, your choice. And we're proud of you! 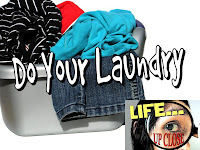 You finally pulled down your pants and tossed those things in the trash! But those things really weren't you, not who you really are." Ernest Ashby (I. Bible Commentary, pg 1458) writes, that the taking off of the self is "not merely habits or conduct,... it goes deeper, it is the very self." It is certainly a noble mindset isn't it? To look at this list wouldn't any of us want to live out these things? Benjamin Franklin thought as much too. In his autobiography he shares the list he made for himself of how he intended to live his life focusing on one a week leaving the others to chance: Temperance, Silence, Order, Resolution, Frugality, Industry, Sincerity, Justice, Moderation, Cleanliness, Tranquility, Chastity, Humility. All well and good for sure and certainly these are good qualities that anyone would like to show the world. Mr. Franklin wrote about his experiment saying, "...I never arrived at the perfection I had been so ambitious of obtaining, but fell far short of it, yet I was,...a better and happier man than I otherwise should have been..." (pp. 76-83). We proclaim him, admonishing and teaching everyone with all wisdom, so that we may present everyone perfect in Christ. Col. 1: 28 When Jesus rules our lives, our self, there is a peace - our assurance of salvation. After choosing to follow Jesus, making him my leader I developed a friendship with Brad. Brad and I hung out a lot. One day while shooting basketball, I cut loose with some colorful language. Brad stopped dribbling, looked at me and said, "Ken, you say you are Christian but your language doesn't back that up." That was the first time I came to grips with the taking off some of the messiness in my life. I had a new self but there was still mess on my clothes. It was time for me to drop my pants and get a new pair. Last week we mentioned those things that cause us to stumble or catch us off guard. Some of those are arguments that sound good – they ring of spiritual. We’ll hear sounds of it on Oprah or Rush Limbaugh – it will come in books like The Secret or Chicken Soup for the Soul. We can immerse ourselves in novels, movies and even sports and try to take on things that “feel” good. They are the same things that caused problems for us in the beginning: lust – language – coveting – idolatry. When the dirt, the mess starts to come off by our choice, our commitment and Jesus truly rules our hearts, only then do we begin to truly live. We need one another to point out the stains and dirt and mess too, we're not God's chosen individuals but PEOPLE (v.12) and we bear with EACH OTHER and FORGIVE (13). Look at your “pants” this morning, how messy are they? I've been called out recently for some of the stains I've got. But look at the last of the list of messes Paul mentions: Do not lie to each other. We’re not perfect people here but people in need of new clothes – new life. As we sing our final song, we're offering you a time to "drop your pants" in the shredder and pick out a new pair (actually a strip of denim). Maybe you need to write out the dirt or just put one letter – then bring it up here and give it up. As you do so, you may need to spend some time doing business with God, or you feel it's time to make Jesus your leader. How many of you have eaten at McDonald's? The golden arches, one of the symbols of America. When Mr. Kraft first started the franchise, his goal was to have a restaurant where you could visit anywhere and receive the same meal and have it taste the same. In a since, he wanted his customers to have a little piece of home no matter where you were: Just like momma cooks it. It doesn't seem to me he imagined his little idea and restaurant would become the center of battle about the America's health and fitness rollercoaster. The US government research has declared we have a crisis as a nation. And McDonald's is to blame. Well maybe that is an overstatement but it sure has seemed in recent years they are front and center in many peoples' mind. Me, I love Mickey D's. 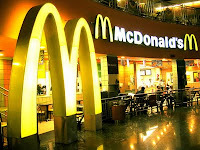 It is my favorite fast food restaurant. I remember the first time I had my first cheeseburger with my dad and it was great. You may disagree with me but I still think Ronald makes the best french fries. 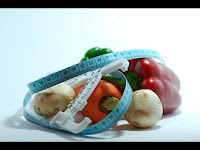 But in his recent documentary, SUPER SIZE ME, Morgan Spurlock attempted to demonstrate the negative results of eating a fast food diet continually. He set out to take in over 5,000 calories a day for 30 days eating only McDonalds and not exercising. Not only did he gain weight but at the same time experienced a multitude of health problems to boot. While the folks at McDonald's have released their statements, another documentary was undertaken by Soso Whaley. She too ate only at McDonalds for a 60 day period and a 90 day period. She however tried to eat responsibly, iimiting her calorie intake and doing moderate exercise 3 times a week. In the end she lost over 18 pounds and dropped her cholesterol levels as wed. Talk about the ups and downs of the healthy diet rollercoaster! But in an article in Relevant Magazine by Ryan Blanck, he gets up close on life and points out"... we have a problem. Many... are facing a condition of spiritual obesity, which if left untreated, may cause harm to their spiritual well being. We take in an inordinate amount of spiritual "calories," but many of us do little to "burn them off," so to speak." We live in a very spiritual world and a very spiritual nation but don't confuse that with a Christian world or Christian nation. We are taking in lots of spiritual calories be it sermons, horoscopes, Christian radio & TV, Chicken Soup for the Soul, Bible Studies, and on and on. So how do we handle this? What is a disciple of Jesus Christ to do to be healthy? Paul writes to the Colossian disciples to help them deal in part with the -abundance of spiritual choices which were surrounding them and many were in-taking. Colossians 2:1-10 ESV For I want you to know how great a struggle I have for you and for those at Laodicea and for all who have not seen me face to face, (2) that their hearts may be encouraged, being knit together in love, to reach all the riches of full assurance of understanding and the knowledge of God's mystery, which is Christ, (3) in whom are hidden all the treasures of wisdom and knowledge. (4) I say this in order that no one may delude you with plausible arguments. (5) For though I am absent in body, yet I am with you in spirit, rejoicing to see your good order and the firmness of your faith in Christ. (6) Therefore, as you received Christ Jesus the Lord, so walk in him, (7) rooted and built up in him and established in the faith, just as you were taught, abounding in thanksgiving. (8) See to it that no one takes you captive by philosophy and empty deceit, according to human tradition, according to the elemental spirits of the world, and not according to Christ. (9) For in him the whole fullness of deity dwells bodily, (10) and you have been filled in him, who is the head of all rule and authority. ONE: From the outset we need to start by getting a healthy balanced diet. We've got to watch what we're in-taking and how much of it. Even too many apples can make you sick so it's not surprising that eating Big Macs all day could cause one have problems. And lets not miss the other side: some of us tend to be in the middle of a spiritual famine and not getting a enough in our spiritual diet! So should we stop reading the Bible? What about Church or listening to The Fish? Paul says we should "be encouraged in our hearts and united in Iove(v2)" and leads us to "continue" in our spiritual journey with Jesus (v6) which is our exercise which will get to in a minute. In watching what we eat spiritually Ryan Blanck and Paul remind us "to be mindful of its quality. There is a lot of spiritual "junk food" out there." There is a whole lot of stuff to make us feel good about ourselves, in Jesus' words, "that tickle our ears," but have no real substance. There is a lot junkfood and soda out there which does us no good for our spiritual growth. Some of it comes under the title of Christian while others come from those who are hostile to the disciples' life. Paul says these may come in the form of fine-sounding arguments (v 4) from human tradition (v 8). The intent is to capture people and leave them empty and hollow and certainly not spiritually healthy. There are many fine sounding arguments about religion and religious leaders, tolerance and peace. In a spirit of humility, Paul reminds us again and again, the mystery of God is only found in Jesus Christ. He is completely God and the only source for the wisdom of living life. My counsel for you is simple and straightforward: Just go ahead with what you've been given. You received Christ Jesus, the Master; now live him- You're deeply rooted in him. You're well constructed upon him. You know your way around the faith. Now do what you've been taught. School's out; quit studying the subject and start living it! (Colossians 2:6-7). One of my youth pastors said to me something which has shaped my walk with Jesus for the past 15 years, "Be the Christian you have become." • Don't make excuses for what you don't know, live what you do know. We know we should eat more fruits and vegetables but maybe you don't know how many of each. Start eating more as you learn how much! Don't know how to study the Bible? Start reading and get involved in a Connection Group to learn more. Don't know what is good stuff to read? Start with the reflections in the worship guide. Go to our website and you’ll find links to sites to help. 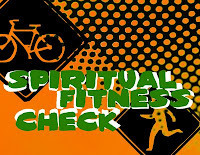 Don't know how to exercise your faith? Mark your calendar for August 1 and come be a part of our Engage Atlanta project at Murphy-Harpst Children’s home. If you still aren’t sure, send me a text message and I’ll help you get going in the right direction. On top of all else, we have the perfect specimen of spiritual health, we've got Jesus who is our leader. Paul reminds us when we choose to follow Him alone then His power and authority are given to us to live the healthy spiritual life. It is this power, Him being God, which guides us through the ups and downs of our spiritual health. Look, life is messy when you get up close. Sometimes I don’t live up to it either. I’ve got that hidden candy bar or snack tucked away – not just in the physical sense but in the spiritual sense – and neither helps. But there is a meal that is here – one that God uses to offer us hope – to allow us to come clean and begin to live healthy again or for the first time. We call it communion and today you have the chance to begin to eat and live right – not on your own strength but on the strength of Jesus. This week, wherever you are, be all there. Make a commitment to not answer your cell phone, text, or e-mail when in a meeting or with someone else. Take off the Bluetooth headset while you eat. Be focused on those around you and give them your full attention. This is one of those weeks where the rubber meets the road. Everything comes together a little bit more than usual. I've been working real hard to stay fit over the years especially as a cancer survivor. The new Health Miles program has been a great help to that. But with my sermon this Sunday on "Healthy Living," I'm taking to the pool for a swim meet alongside my kids! I confirmed tonight I'm swimming in the 25m freestyle, 50m freestyle and likely anchoring the men's 100m relay team! Funny thing is, while I was a lifeguard and lifeguard instructor, I never swam on a team till this weekend. Come find out Sunday the results! We're going to have a blast and you won't want to miss it. It is like living in a theme park. We're 0-80 one minute, slowing down to a stop the next. Let's not mention the long lines! 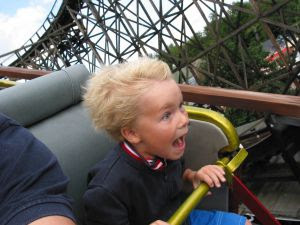 If you spend a day at Six Flags, I think you should get a credit for one year of life because in 12 hours @ Six Flags you get all the emotions and experience and you have to pay for it. You may never have been to Six Flags, but most of us have been to Disney or a county fair and we know the thrills and the fear, and how thankful we are when we get our feet back on the ground. In their book, "Happiness is a Choice," Doctors Minirth and Meier make a simple but profound statement: HUMAN BEINGS RESIST CHANGE (pg. 118). They go on to print a scale giving events a point value. During the course of a year, if those point values reach and exceed 200, there is a significant increase in mental health.^Some of the items include the death of a spouse which has a value of 100 points, divorce @73, health of a family member @ 44, change at work @ 20 points, even vacation @ 13 ranks among others. In the year 2000, during a 7 month period, my point total exceeded 350 and was diagnosed with depression. No one is immune to the ups and downs in life. Contrary to what some may teach; being a disciple of Jesus Christ is not a free pass either. In this letter to the Colossian church, the writer, Paul, gives us the counsel that no matter our circumstances, being a disciple of Jesus offers us true hope and a freedom from fear, from fate, from trap of materialism and social and economic disorders. We should have a confidence during the ups and downs. Much like the letter to the Galatians, Paul is writing to respond to a problem in a church. There is a problem in what is being taught or maybe what is being neglected to be taught. In the first chapter, Paul wastes no time in bringing us to know the solution: Regardless of what you are hearing: JESUS CHRIST IS GOD'S SON AND THE ONLY WAY TO ALL SPIRITUAL WISDOM AND SALVATION. Coming from a person like Paul who is writing this letter from jail (4:10, 18), been beaten by mobs, shipwrecked and sick, this letter and these words carry a lot of weight. This comes from a man who knows first hands the ups and downs. It seems to me then we are offered a pattern or guide by Paul in this opening of his letter. Starting in verse nine Paul tells the church they are praying for them: non-stop. Like a NASCAR race sure there are pit-stops but there are no time outs. The Colossian church had a reputation and Paul and the Christians around him believed in it. But they didn't just "pray for them," they got specific about it too. The pray had purpose. First, it addressed part of the problem, Paul prayed for wisdom and knowledge, knowledge about God's will for their church. Paul wants us to have no confusion. In a world where everybody's beliefs are ok and truth is flexible depending on the situation: there is truth in Jesus Christ. Starting FIRST with this: Jesus is God (v. 15/19). No escaping it, Jesus said it himself in John: If you see Me you have seen the Father (14:9-1 1). SECOND: Jesus is the Creator (v!6). Every thing you see and even what you don't see, HE made it! Do you think angels are more important than Him? Satan? Nope. THIRD: Jesus is the Leader (v. 18). No person is the boss of the Church, it is Jesus alone who directs our purpose and it is Him alone we follow. FOURTH: Jesus is the Sacrificer (v. 20). Believing in His blood and death on the cross and His resurrection are all that is necessary for becoming His disciple. Nothing else is needed. FIFTH: Jesus is the Perfecter (v. 28). There is a purpose for us: to become like Jesus; to help others become like Jesus. But how does Paul say it happens? "I labor, struggling with HIS energy"
We are going to face difficulties, the ups and downs, the changes. As I look back I see how this pattern of Paul's: non-stop prayer and getting wrapped up in my beliefs about Jesus brought me healing from depression along with a caring doctor to guide me. I have had the opportunities to help others through similar situations. Paul's own life was marked by many ups and downs we have never come close to experiencing yet he remained faithful to the end. 014. Pray for your fire department, police and ambulance crews. When you pass them on the road, hear the sirens, or drive by the station, take a moment and pray for these women and men. They gave hours untold, spend time away from their families, and put it all on the line. There is much to learn from the animal world regarding life. We have a fifty gallon fish tank. It is peaceful to watch these creatures swim gracefully through the water with not a care in the world. Yet when I venture into the yard I often find snails. They seem to carry the weight of the world…literally. Families receiving a special needs diagnoses, find any thought of ‘swimming’ through life disappears. Everything changes: life, dreams and the hopes of the future – a weight unlike any other. Terms unknown to most of us years ago, now are common place in our vocabulary. However, it does not mean we understand the effects on a family any better. Many of us have no idea what it must be like to walk a mile in the shoes of any of the adults or children who are trying to make their way in a world of Autism and Aspergers. Kitty Draut felt the effects personally of such a diagnoses in her family and it led her to step out and do something to help. Her passion for making a difference in the lives of children and families gave birth to The Autism Sunshine House (TASH). Located on Cedarcrest Road, between Cobb and Paulding, TASH provides help and hope for neighbors right here. Kitty’s vision is to provide a place to support special needs families and offer the services and therapies needed by children with Autism and Aspergers. For special needs children and their families, the need for services, support and connections are incredible. Because of TASH, many are beginning to find help is right next door. Maybe you can be the help next door for a child and family with special needs too. We can all be more understanding and patient with families with such needs. Maybe try to learn more and ask questions. Just being neighborly and offering a smile can make a difference during a hard day. Maybe there is a family who has not heard about TASH. Pass on this article and let them know there is a place where they can find a place where the sun truly shines for their child and for them! For more information: www.autismsunshinehouse.com. Or call 770.974.7592.